Description of "Knowledge and Effective Curriculum (eBook)"
Academic Knowledge Construction and Multimodal Curriculum Development builds a conceptual and political foundation that supports multimodal practices in education. It frames practical conversations with philosophical and theoretical concerns regarding the use of digital technologies in educational processes. Knowledge is synonymous with information and that accessing information equals learning. This book challenges such thinking. Thinking and means of thinking and rethinking affect teachers and students, and influence curriculum. Education, knowledge and thus this book, involves lived experiences of learning. Innovations and change impact teachers, learners and curriculum. As educators increasingly incorporate newer technologies in the administration, planning and implementation of instructions, revision of curriculum is obvious. Newer applications sharp thinking, imagination, sensing, observation and implementation continuously, newer forms of information and knowledge are to germinate. Broadening and widening of created knowledge will likely, force to improve curriculum. Curriculum change is evident, in this scenario but what may be the effective and valuable curriculum, this is a very eminent question stationed before us. This book explores shifts in teaching and learning, in this enlightening age of information and knowledge. By examining pat-terns and practices of knowledge construction in elementary, secondary, college and university classrooms, the authors examine commonalities and differences in practices across educational levels, disciplines, and in-school and out-of-school settings. This text presents models, ideas, examples and theories to prod critical reflections leading to praxis that acknowledges local/global contexts, histories, cultures and conceptual frameworks. I hope this book will assist the learners to get concrete and absolute, information and knowledge, and will satisfy them to all their active and unsatisfied sites. 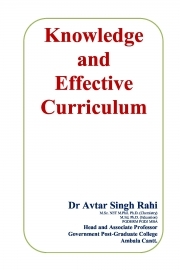 Reviews of "Knowledge and Effective Curriculum (eBook)"